Like a birth announcement for the tree, the baby girl's arrival glass personalized Christmas ornament is a perfect holiday gift for parents, grandparents and godparents. You might consider putting one away in the little gal's hope chest too. It's handcrafted from semi-transparent glass, so the festive lighting surrounding it will illumine its globe throughout the season. 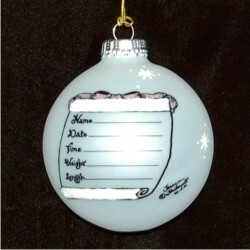 Well add the specifics onto the ledger of the baby girl's arrival Christmas ornament and include a warm message from you on the back, all done in artistic, hand painted script. This is one of our baby girl ornaments personalized for the recipient arriving in in a custom gift box that just needs a pink ribbon to be perfect. For Granddaughter Nov 8, 2014 Deanna M.